$160 Members/$190 Non-members Pencils and paper provided! Watersoluble colored pencils combine the precision and control of pencil drawing with the fluid possibilities of watercolor paint. Come explore the many ways these versatile drawing tools can be used—wet or dry, alone or for mixed media. Derwent, the leading makers and innovators in this fine art medium, supplies their best products for use in this class. Try them all in this class — plus you’ll receive pencils and paper to keep. 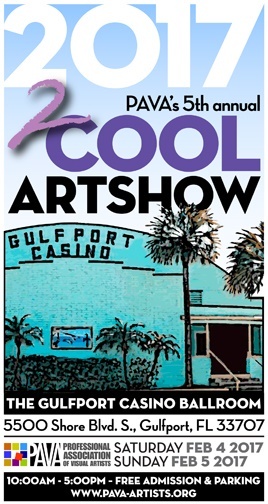 The 5th Annual 2Cool Art Show is this coming weekend, March 4-5 at the Gulfport Casino. This indoor show features about 36 artists and I’ll be among them in my usual spot, booth #3. And I’ll be showing three new abstract colored pencil pieces! Make a day of it. Gulfport is a funky waterfront community with lots of restaurants. Show hours, 10 – 5 both days. Free parking, free admission.